TyphoonBackup works perfectly with TyphoonDrive, allowing you to safely store all your files in the cloud. At any time you can access your backed up file online, from anywhere through the TyphoonBackup website. In the event of disaster, you can quickly recover lost files by browsing your TyphoonDrive, and right clicking the file you want to recover, just choose Recover and the files will come flying back to you. ...... and right clicking the file you want to recover, just choose Recover and the files will come flying back to you. 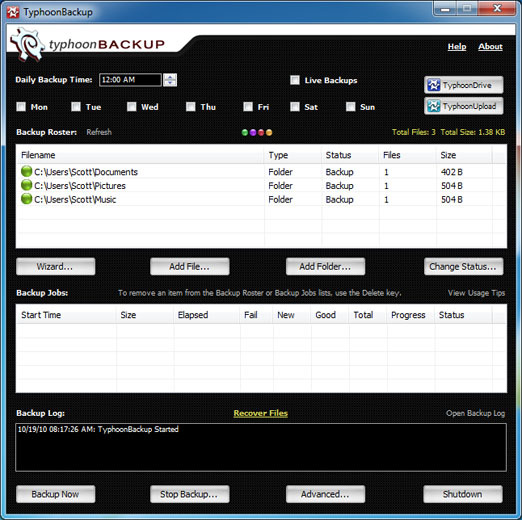 TyphoonBackup is part of the TyphoonTools Premium software suite, which includes TyphoonDrive and TyphoonUpload. Stop worrying! You can set it up in just a few seconds and sleep at night knowing all your data is backed up! The only safe deposit box you'll ever need for your data. Your data is 100% encrypted so its safe and secure. TyphoonBackup makes it easy to retrieve individual files or your entire backup in just minutes. You can access your backed up files anywhere you go. On the road? In an airport? Your files travel with you. Try TyphoonBackup free for 30 days! Guaranteed spyware free and adware free. 30 day money back guarantee. Qweas is providing links to TyphoonBackup 2011 as a courtesy, and makes no representations regarding TyphoonBackup or any other applications or any information related thereto. Any questions, complaints or claims regarding this application TyphoonBackup 2011 must be directed to the appropriate software vendor. You may click the publisher link of TyphoonBackup on the top of this page to get more details about the vendor.